"If you can read this you are obviously a teenager who understands bad grammar and illegible handwriting..."
Her shirt fitz Gerald but doesn't fit her! 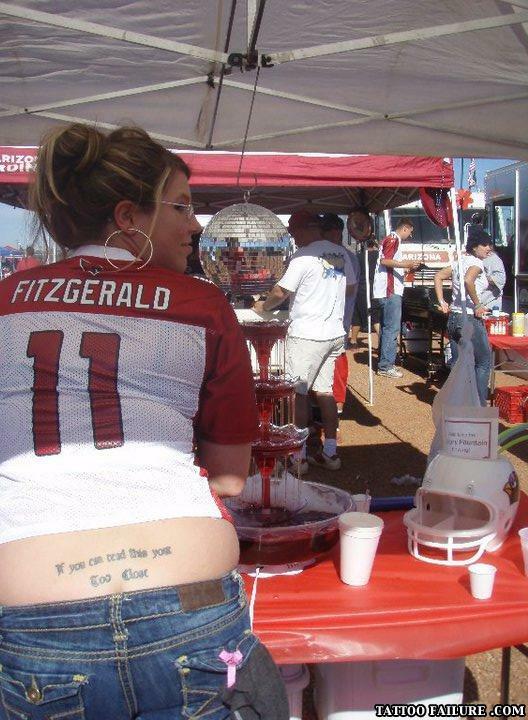 By my standards, if I could read the "11" I'd be too close to this girl. "If you can read this your too close" .. What about my too close? Word of advice, before getting a tattoo, maybe make sure the artist passed 5th grade English class. It looks a little swolen. If you can read this...I've gained 40lbs and don't fit in my shirt! I want that disco ball. I love the way the disco ball is attached to her right shoulder.